Big Cottonwood Canyon, originally uploaded by flahute. 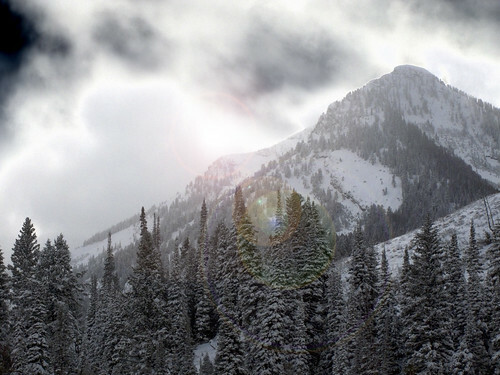 Fun with Photoshop … image taken 12/14/2008 in Big Cottonwood Canyon. Yesterday’s storm which hadn’t completely blown over yet this morning, dropped about 15-inches of fresh snow up Big Cottonwood Canyon (and probably a little more in Little Cottonwood Canyon), so I finally headed up to get in my first turns of the season. Solitude Mountain Resort still isn’t completely open, as the coverage is still a little thin, but there was enough snow for the resort to open the Powderhorn lift today … this helped my decision, since if I’m going to be stuck on the frontside, I didn’t really feel like skiing mid-mountain lifts all day. Had some problems with my boots on the first run … but some buckle adjustments let my feet settle in after the third or fourth run of the day. Weather was cloudy up there most of the morning, although the sun did start peeking out about 1:30 or so. On the way back down the canyon, I stopped and grabbed a few quick photos on the new Canon PowerShot G10, I got a few weeks ago. Still trying to figure out a lot of its features. It’s definitely bigger and bulkier than my last Powershot, but not nearly as big as my Nikon DSLR kit, but it’s a nice little camera that does let you capture some great images. Nice! Are you a Solitude regular? I haven’t gotten up there yet bc I was yurting this weekend in Mill Creek. I have a Solitude season pass MTuFSu. Maybe I will see you up there one day!